The Marijuana Policy Project has filed paperwork with state election officials to form a committee to begin raising funds for a 2016 citizens initiative to legalize recreational marijuana use. Arizona voters narrowly passed Proposition 203 allowing medical cannabis use in 2010. Communications Director Mason Tvert said the group has plenty of support in Arizona despite the state’s traditionally conservative voting patterns. 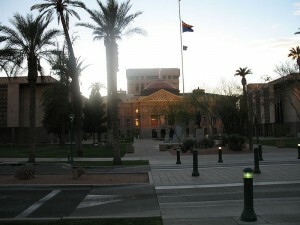 Tvert said the Arizona initiative would be modeled closely on a previous movement in Colorado, which became the first state to legalize recreational marijuana in 2012. Washington was a close second. According to Tvert, the medical marijuana business here needn’t worry about losing its 52,000 registered cardholders. Like Colorado, there would likely be a differentiation in the medical and recreational business models. First, only people 21 and older could purchase recreational weed. In both Arizona and Colorado, the threshold for a medical card is 18 years old. Those under 18 can obtain a medical card if their legal guardian is their designated caregiver. There could also be a marked difference in pricing. In Colorado, recreational shoppers pay nearly 13 percent in general and special state sales tax, plus a 15 percent excise tax at the wholesale level. Meanwhile, medical cardholders pay the 2.9 percent state sales tax and any local taxes. Dispensaries for recreational and medical marijuana are kept completely separate, even if the same owner operates both. Tvert said this separation as well as the different tax rates keep existing medical card holders from flocking to the recreational dispensaries en masse. “If you went into a business in Colorado that was doing both and said, ‘I want Product A, but it’s only on the medical side,’ then you can’t get it if you don’t have a license,” he said. Sarah Philyaw, a manager at Arizona Organix in Glendale, one of the first medical dispensaries to open in the state, said she would definitely welcome recreational sellers to the fold, even if it meant more competition. She said one way to differentiate the two business models would be to sell specific strains and products to medical cardholders and recreational users, as Colorado does. One of the more popular medical products at Arizona Organix, Philyaw said, is a CBD, or cannabidiol, tincture. The sublingual oil doesn’t contain THC, or the main psychoactive property of cannabis. Not everyone sees marijuana as so harmless. The Arizona County Attorney and Sheriff’s Association signed a resolution in July opposing full legalization, citing various detrimental effects of marijuana use. “It is demotivating, it hurts student achievement, it creates additional crime,” said David Leibowitz, spokesman for the Arizona Association of Counties. The resolution was sponsored by MATFORCE, an organization aimed at reducing substance abuse in Yavapai County and statewide. Executive Director Merilee Fowler said there is a lot of misinformation about marijuana use, particularly among young people. “In kids’ minds, when you say that something is legal, the perception of risk goes down and youth use goes up,” she said. Fowler also pointed to teens abusing legal drugs like alcohol and tobacco. “Why would we want to add a third legal substance that’s going to cost our nation?” she asked. State Rep. Ethan Orr, R-Tucson, disagreed with this perception that minors would be more likely to use marijuana if it was legalized. “I believe it’s actually less likely to get in the hands of the minor because the people (licensed dispensaries) that are supplying it have an incentive to work with the state because they want to keep their license,” he said. Orr, who is planning to introduce a proposal of his own to legalize recreational marijuana before the state Legislature next year, said one only has to look at Colorado to see the benefits of legalization. Orr said that extra money could then be funneled back into law enforcement, education and possibly tax cuts. Orr said he also favors a dual-track system that allows medical dispensaries to continue operating independent of the recreational side. The Marijuana Policy Project ’s Mason Tvert said if recreational use passes Arizona, existing medical dispensaries could have first dibs on selling recreational products as long as the inventories are kept separate. Whatever happens with Arizona’s marijuana business, Tvert said the initiative coalition will be sensitive to local needs. This entry was posted in CBD In The News. Bookmark the permalink.